John Taylor came to the 104th New York National Boat Show ready to see the latest model that Striper, a division of Seaswirl, had to offer — only to find the brand missing from the show this year. 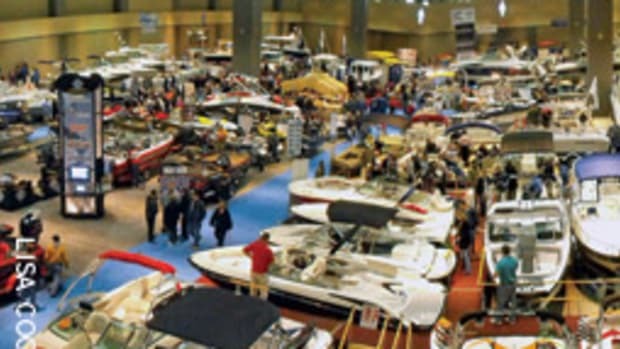 A change in show dates was the reason Seaswirl didn’t exhibit this year, according to the company’s vice president Jason Scruggs. This year’s show — the 104th — took place Dec. 13-21, nearly two weeks earlier than in the last five years when the dates ran through the Christmas and New Year’s holidays. Last year’s attendance was 61,464, down about 3 percent from 2006. From 1986 to 2002 the show was held after New Year’s Day, but in 2003 the Javits Center, longtime home to the show, shifted the dates back into the holiday block. Average attendance before the switch was around 95,000 to 100,000, says Michael Duffy, show director for the last 17 years. That number fell to around 75,000 after the 2003 switch and saw a 49-percent drop for this show. Duffy says organizers hoped holding the show before the holidays would boost sales. 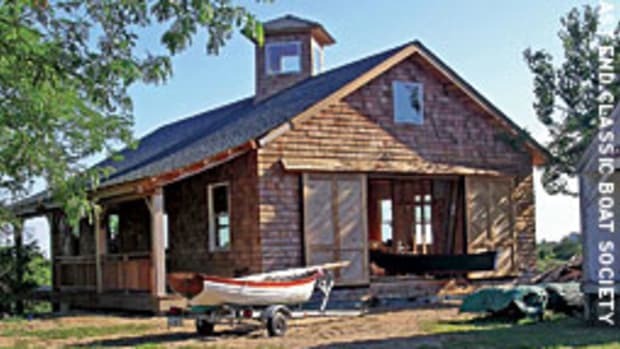 However, Rich Nau of Sandy Pond, N.Y., thought few people would be interested in buying a boat for Christmas in this economy. “People are worried about having the money to spend on Christmas presents for their families; they aren’t thinking about boats,” says Nau, who says those he spoke to were surprised the dates were so early. Broad Channel, N.Y.-based Buster’s Marine Service, which is a Mercury Platinum Dealer that also offers Mako, Seacraft and Tahoe, also thought there wasn’t enough notification about the date change. Duffy says, however, that the show this year did more advertising than ever before, launching a viral campaign that started in July, which included a video on YouTube. Organizers also sent e-mails to more than 100,000 people notifying them of the date change. Two anglers at the show were looking to buy, but were downsizing from their previous vessels. 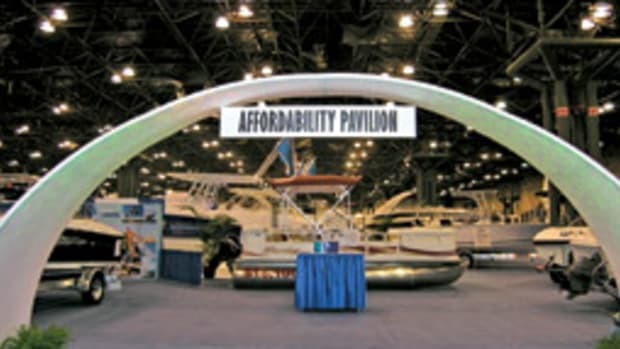 Hodroski says he’s been attending the boat show on and off for the last 10 years and he noticed the show floor was short on visitors — and selection. Despite 100 dealers and 255 contracted companies exhibiting, people walking the floor noticed the shift: in previous years, numbers had been 275 to 280 companies and 120 dealers. 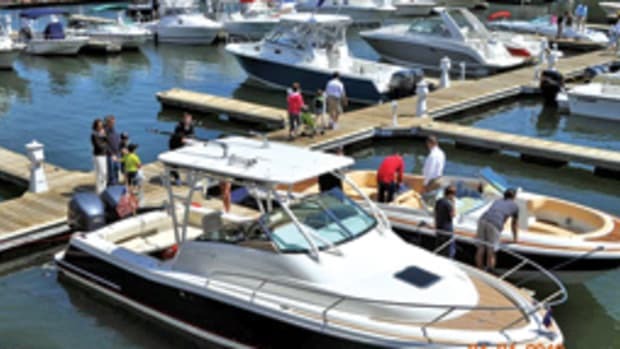 Robert Arcate, sales representative for Mariner’s Cove Marine in Hampton Bays, N.Y., and Bay Harbor Motors, Staten Island, says the people who attended were still interested in their higher-end boats, such as Fountain Powerboats. Arcate says people are attracted to the smaller, trailerable models so they don’t have to worry about having a place to keep them during the winter. This is the third recession I’ve seen after 35 years in the business, and these types of high-end vessels have always done well,” says Arcate. 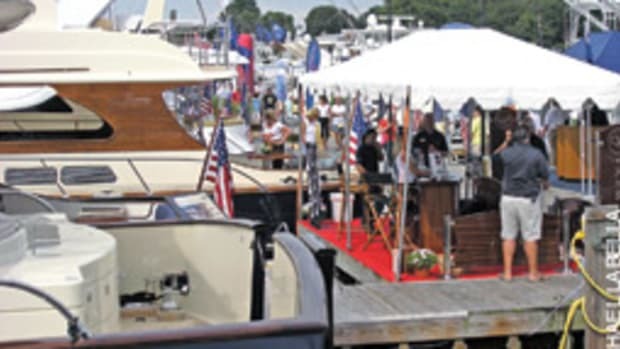 For those who can’t afford such high-end vessels, the show introduced an economy section, sponsored by Discover Boating, displaying eight different boat models that could be financed for less than $250 a month. Models included a Mako 171 Center Console with a Mercury 90 hp 2-stroke outboard for as low as $140 per month, and a Bayliner 185 for around $169 per month. 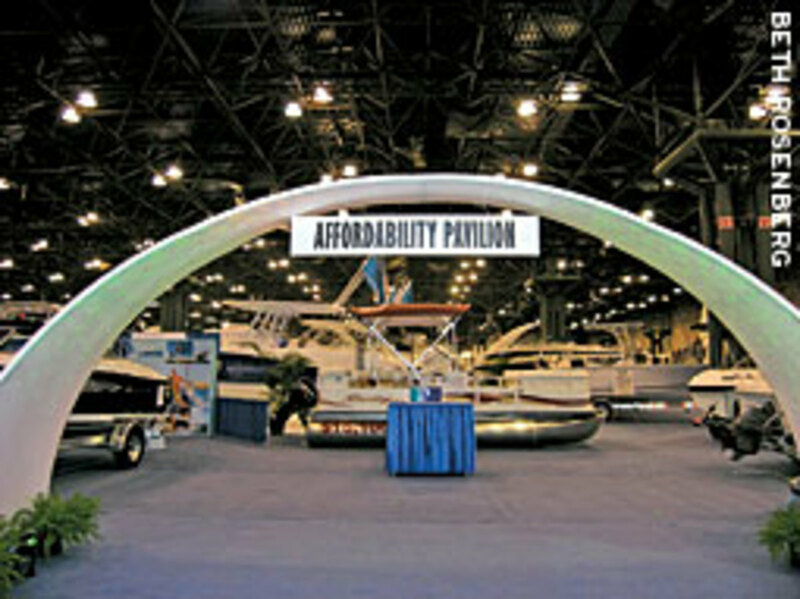 The booth also offered fliers with guidelines on what to look for when buying a boat. “About 75 percent of boaters are making less than $100,000 per year, and we want to show people how accessible it can be,” says Duffy. Many manufacturers offered deals such as extended warranties to lure interested parties, says Duffy. At press time, the dates for the 2009 show had not been set. Duffy says it would be ideal to have the show in mid- to late-January. “This year proved that there is sales action out there, and that a show is still the best place dealers and manufacturers can display their product,” says Duffy.